Our 1 x Epson PRO7700 PRO7900 350ml Yellow Ink Cartridge is great value and will be delivered to your door very fast! 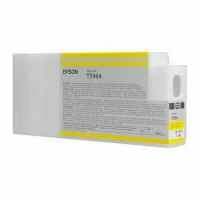 The 1 x Genuine Epson PRO7700 PRO7900 350ml Yellow Ink Cartridgeis just one of thousands lines we supply. With such a huge range, you are sure to easily find all the cartridges you need for all other printers you may have. With our superior buying power, we can pass on the great savings to our valued customer! Our 1 x Epson PRO7700 PRO7900 350ml Yellow Ink Cartridge is covered by a full manufacturers warranty! If your product is faulty, please check with us to organise a replacement or refund. See our warranty information page for full details. We accept payment by Visa, Mastercard, Direct Bank Deposit, Internet Banking, Cheque and Australia Post Money Order. There is absolutely no surcharge for using credit card or any other payment methods. Credit card payments are securely processed by eWay, we do NOT store credit card details, and NO credit card data or information is stored on our site in any form! We use FAST Australia Wide courier delivery and Express Post. Your 1 x Epson PRO7700 PRO7900 350ml Yellow Ink Cartridge will usually be despatched from either the Melbourne, Sydney, Brisbane, Adelaide or Perth Warehouse the same day if ordered before 3pm. As a general guide, deliveries to major cities will take 1 to 3 days whilst it could take up to 5 days for remote areas. FREE delivery for orders over $50.00 or only $4.95 for orders under $50.00. See shipping policy. page. Use the 'Add To basket' button above to buy now. If online ordering is not for you, but our offer is too good to turn down, then why not call us on 1300 88 55 68, and our friendly staff will handle your order personally. Thank you for choosing HotToner for your printer cartridges. Buy High Standards and Low prices 1 x Genuine Epson PRO7700 PRO7900 350ml Yellow Ink Cartridge here at HotToner and save!